In Chhattisgarh, MP & Rajasthan, Congress won in 56% of seats where Rahul Gandhi campaigned while BJP won in 48% of seats where PM Modi held rallies. 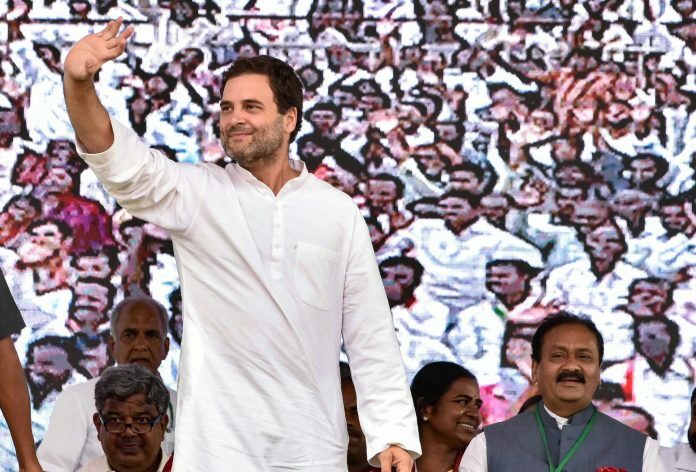 New Delhi: Congress president Rahul Gandhi who addressed 58 rallies across the Hindi heartland states has had a decent strike rate, with his party winning in 56 per cent of the seats. The Congress president’s strike rate — the percentage of seats won by the party out of the total number of seats where he held rallies — is even better than that of Prime Minister Narendra Modi. Of the 58 constituencies where Gandhi held rallies, the Congress has won in 33 seats. In contrast, Modi’s strike rate was 48 per cent across these three states. The prime minister addressed rallies in 27 constituencies in the three states, of which the BJP has won in 13. The Congress’ best showing, among the heartland states where Gandhi addressed rallies, is in Chhattisgarh. Here, of the 18 seats where he held rallies, the party has won in 14. In Rajasthan, where Gandhi held rallies in 17 constituencies, the party has won in eight. The Congress president held rallies in 23 constituencies in Madhya Pradesh, of which his party has won in 11. Gandhi led the charge especially in the absence of a chief ministerial candidate in the three states. He even released the party manifesto in Chhattisgarh. In most of his rallies in Chhattisgarh, Gandhi highlighted the plight of the farmers, corruption in the state, especially by referring to the Rafale scam and the anti-incumbency of 15 years. Apart from targeting the chief ministers of the BJP-ruled states, his prime target was Modi. For instance, during a rally in Rajasthan, Gandhi had slammed Modi and Rajasthan Chief Minister Vasundhara Raje in the latter’s stronghold of Dholpur, focusing on their “lack of schemes for the farm sector”. “For four-and-a-half years, Narendra Modi has been the Prime Minister and Vasundhara Raje has been your chief minister… What did the BJP do for the poor, the farmers?” he had asked at the rally in Dholpur’s Mania. Congress leaders say that their president also ensured that he spoke on his vision for the state. “His rallies were a hit as he was able to connect to the people and was able to deliver his message across easily. He used the rallies to tell people not only about the BJP misrule but he was able to run a positive campaign by telling people his vision for the state,” said Chandan Yadav, secretary, Chhattisgarh Congress.